We attended a couple of sessions relating to the projects we’ve been working on – Watcher and Mistral. At the Watcher session, the core team explained what had happened in the project since the April Summit. The highlight was that the project has been accepted into the Big Tent as of May 2016 – this of course is great for the project and will hopefully lead to greater traction over time. The Watcher framework has also evolved significantly during the Newton cycle, now offering a robust, comprehensive framework which can support Openstack system resource optimisation over longer timescales (slides). Following the presentation of the status of the Watcher project, there was a design meeting at which we had the opportunity to give input to the future direction of the project. It was really great to sit around the table and discuss this face-to-face with the team (we had only attended IRC chats heretofore). The team is still working through the best way to obtain most efficient use of an Openstack system – for some definition of efficient – but there was great energy and good ideas around how to progress. We hope to be able to make further contributions here in future. We also sat in on some of the Mistral focused sessions: Mistral is establishing itself as a useful tool in Openstack operations which supports more intelligent automation of tasks. The tool is receiving some interest in the telecoms world – particularly around NFV use cases – but it is more generally applicable. During the Newton cycle, the team managed to greatly improve Mistral performance – mostly through improving DB operations – as well as improve overall system robustness. In the Ocata cycle, priorities are around supporting custom tasks and visualisation of the workflow as it progresses. Nokia sponsored a nice talk focused on their Cloudband Network Director which supports deployment of TOSCA based NFV applications using Mistral; it also tied in the attractive Vitrage work to provide quite a compelling proposition. Generally, we felt the Mistral project provides a useful albeit modest contribution and has a clear idea of where it wants to go – you will likely hear more about it in future. There were a couple of other interesting talks we sat in on: there was a nice talk on kernel based monitoring of microservices for security purposes from the IOVisor project – the early results from this were interesting and it may be possible to consider their monitoring mechanisms for performance monitoring. There was also a reasonably interesting talk which described Perfkit Benchmarker and how it can be hooked into Elasticsearch and Kibana to provide understanding of cloud performance. Another interesting talk from our friends at UFCG introduced Arrebol, a service for executing and managing the lifecycle of Bag-of-Tasks applications within the cloud – the concept looked quite similar to Mistral but key difference is in how Arrebol is able to leverage federated clouds with their Fogbow solution in a hybrid context in order to meet user quotas in multiple clouds and distribute the application accordingly. Apart from the projects we are working with, the most interesting session which we attended today was one focused on cloud economics. This was a panel session chaired by the excellent Owen Rogers from 451 Research and has representatives from Juniper, Midokura and Godaddy, all of whom were appropriately opinionated. The session covered many aspects of cloud economics – overall TCO, the role of hybrid cloud, the role of containers and cost vs value based hardware purchase decisions. Some interesting points included analysis by 451 where they found that a well run private cloud can be as cost efficient as public cloud; analysis which indicated that containers can be twice as efficient as VMs for similar workloads (when it’s not necessary to have multiple copies of the OS) and the fact that enterprises are not so sensitive to fluctuations in public cloud pricing as stability and reliability is usually a higher priority. The highlight of this discussion was the story recounted by Juniper about a recent Silicon Valley panel discussion which had a significant container focus – there was a bit of discussion on the panel about how containers will bring significant change to enterprise computing to the rapid detriment of legacy systems. The UBS guy on the panel was not so vocal for some time and eventually he was asked his opinion – he noted that everything that the container proponents called ‘legacy systems’ was what the banking world called ‘stuff that just works’. This final point really resonated with us and served to emphasise the point we observed yesterday around Openstack being a good, flexible enterprise integration layer. Its feature set is growing and it can deal with an increasing amount of different scenarios – containers, bare metal, hybrid configurations etc – that are demanded by enterprise computing. This broad offering is its key benefit and it’s difficult to see how it will not establish itself in the enterprise in the next couple of years and remain there for many years to come. Hopefully it will continue to evolve such that it will not be seen as a legacy technology a decade from now: the energy and enthusiasm we’ve seen this week gives us reason to believe this will not happen. Adios Barcelona. 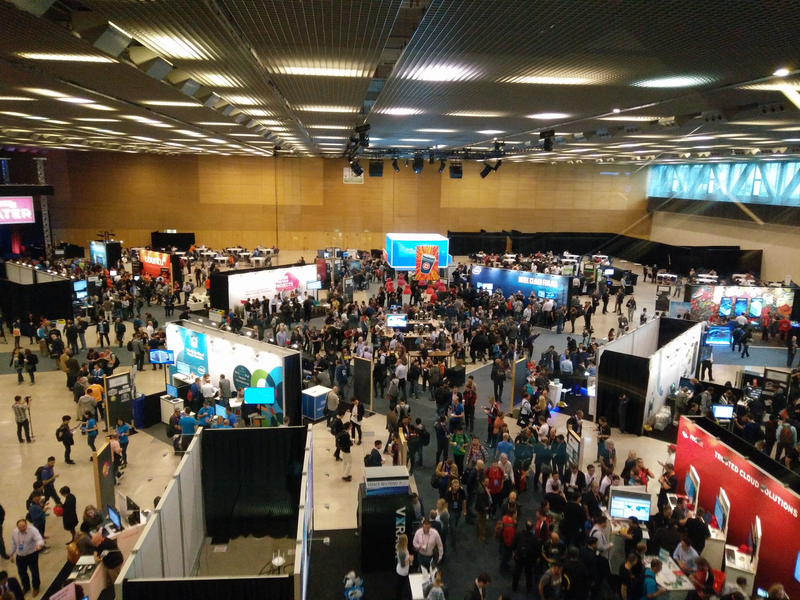 This is our final day at the Barcelona Openstack Summit 2016, but we will provide some reflections on our impressions of the event and what we learnt once we have had a little time to relax after these intense few days and digest it all. This entry was posted in *. * and tagged 2016, Arrebol, Barcelona, BPF, Mistral, openstack, Summit, watcher by Bruno Grazioli. Bookmark the permalink.